Advice: Investors may BUY with a 2 year perspective. Overview: LTTS is a global pure-play engineering R&D services firm, a part of L&T group. LTTS had revenues and profits of Rs 3,143 crores and Rs 416 cr. resp. in FY16. Its revenue, EBITDA and PAT have grown 18.9%, 40.7% and 34.0% this year. The contract R&D services help firms develop and deliver products to end customers. After the IT services sector growth over the last 2 decades, the ER&D sector appears to be the next generation opportunity for more advanced, sector specific product development services. The govt. has set up a Make in India program to encourage mfg. However ER&D services seem a more likely candidate for local success as it accelerates mfg. and innovation. LTTS key customers include BMW, Calsonic Kansai, Caterpillar, Danaher, Eaton, Intel, John Deere, P&G, Rockwell Automation, Scania, Shell and UTC. The primary risks are: 1) highly dependent on customers in North America and Europe 2) Forex fluctuation risks 3) Uncertainty around M&A and growth potential. As an investment, the LTTS IPO is rated a medium risk, medium return type of offering. Outlook: Investors may Buy LTTS with a 2 year perspective. Here is a note on L&T Technology Services Ltd (LTTS). IPO opens: Monday 12-15th Sept 2016 with Issue Price band: Rs. 850-860 per share. Shares offered to public: 1.04 crore of FV Rs. 2/share, Market Lot is multiples of 16. Shares offered are 10.2% of equity. The IPO is of Rs 894 cr. (upper end of band) which is a sale by promoter L&T; there is no fresh issue. L&T held 100% in LTTS pre-IPO. The IPO shares are available to institutional, non-inst. and retail in ratio of 50:15:35. Post IPO shareholding will be L&T promoter 89.8%, QIB 5.1%, NIB 1.5% and retail 3.6%.The IPO will unlock value for L&T. The grey market premium is Rs 95 – 96, a positive. (as on Friday 9th Sept). LTTS is a global pure-play engineering R&D services firm, a 100% subsidiary of L&T. LTTS had revenues and profits of Rs 3,143 crores and Rs 416 cr. resp. in FY16. Its revenue, EBITDA and PAT have grown 18.9%, 40.7% and 34.0% in one year. There are only 2 years of data on LTTS. LTTS has 26 sales & 12 delivery offices globally, and totally 9,400 employees. LTTS was created by a business restructuring in 2014, merging 1) the Integrated Engg. Services div. of L&T and 2) Product Engg. Services div. of L&T Infotech. LTTS has verticals such as transportation, industrial products, telecom etc. Fig 2. They provide a set of services to mfg. technology and process engineering firms, to help develop and build products, and deliver these to their end customers. LTTS offers design & development solutions to the product dev. teams in the areas of manufacturing, engineering, embedded systems, software and process engineering. For “new” technologies, LTTS provide services and solutions in the areas of product lifecycle management, engineering analytics, power electronics, M2M connectivity and IoT. They focus on innovation and tech. leadership and have set up labs specific to industry verticals to replicate customers’ environment, enabling them to work closely with their R&D teams on innovations. LTTS ‘s key customers include BMW, Calsonic Kansai, Caterpillar, Danaher, Eaton, Intel, John Deere, P&G, Rockwell Automation, Scania, Shell and UTC. Revenue geography is in Fig 1. LTTS’s revenues are generated from services provided on either a time-and-materials (T&M) or a fixed-price (FP) basis. For contracts on a T&M basis, they charge their customers on the basis of the hourly billable rates of employees. 31.9% of LTTS’s revenue were from FP contracts and the remaining 68.1% of the contractual revenue was T&M based for FY16. Repeat business from existing accounts was 98.7% of customers in FY15 and 94.6% in FY16. The top 5, 10 and 20 customers gave 22.8%, 36.2% and 53.8% resp. of FY16 revenues. LTTS had 3 $20m+ clients and 8 $10-20m clients in FY16. LTTS added 36 new customers in FY16. Today, LTTS has 200+ clients out of which 50 are among the Fortune 500 companies. LTTS has been recognized by Zinnov in the “leadership zone” in 8 industry verticals (industrial automation, construction and heavy machinery, medical devices, aerospace, auto, rail and marine, telecom, energy and utilities) and 2 horizontal service offerings (embedded systems & mechanical) in Zinnov’s GSPR Ratings 2015. Leadership: A.M. Naik is non-exec. Chairman; Keshav Panda is MD-CEO and P. Ramakrishnan is CFO. L&T is a diversified engineering, construction, mfg., technology and financial services company. Income and PAT has grown at 12.4% and 4.3% CAGR respectively over 5 years. In the same duration EPS witnessed a fall of -8.03% CAGR. P/E ratio has however risen to 27.5 times today. See Fig 4. L&T has low net profit margin of 5.21%. The dividend yield for L&T is 1.24%. The RoCE stands at 10.6% and RoE at 11.33%. This is average performance. This is the third listing from the group after L&T Ltd, L&T Finance and L&T Infotech. L&T’s share price gained only 12% CAGR over the last 5 years with CMP Rs 1,518. However we are positive that the investment cycle and infra focus has started as the economy picks up. Sectors like defense, railways, roads and construction are recovering. L&T is best placed to benefit from this, given its exposure to diverse sectors, its strong balance sheet and good cash flow. LTTS will double revenues in 3-4 years, per Chairman AM Naik, partly from M&A. LTTS is collaborating with startups to either take or jointly built solutions in the IoT space to its global customers. They believe there is a level playing field for startups with large companies. LTTS is a sponsor of the Nasscom’s centre of excellence for IoT in Bengaluru. LTTS plans to invest in start-ups valued at $50m or less with revenues of $20m which need financial muscle to grow, in areas of IoT, cloud & automation tech. The Indo-American Chamber of Commerce (IACC) conferred LTTS with the Company of the Year award in June 2016. This is the highest distinction conferred by the IACC. LTTS in Aug 2016 opened a new engineering center in Dublin. LTTS collaborated with Redknee Solutions in June 2016, to offer the architecture for enterprises to enable connectivity, analytics and monetization for IoT. Attrition rates at LTTS in Q1FY17, FY16 and FY15 were 13.2%, 12.1% and 14.3% resp., quite low compared to the IT services industry. The company has filed 34 patents and co-authored 134 patents with clients & others. The Rs/$ rate is 66.5. We expect a range of 65-70 Rs/$, over 6 months, a flat outlook. The unofficial/ grey market premium for this IPO is in the range of Rs 95 – 96. L&T Tech Services raised Rs 268 cr. via anchor (institutional) investors on 9th Sept.
India’s ER&D environment is a healthy mix of service providers, captive centers and start-ups. Currently, there are over 350 captives, with around 60% focused on hi-tech verticals, and the infrastructure and industrial automation realms. Firms spent a total of $ 1,007 billion on R&D and engineering activities such as product & process development, manufacturing engg. and other allied tasks in 2015. India is a of key market for the setup of ER&D centers. There is a resurgence in the setup of new ER&D centers in India. A total of 44 new offshore centers were set up globally in 2015 and nearly 70% of these were set up in India. India and China are key markets for offshore in-house R&D centers. Prior to 2010, the India-based ER&D service industry was providing low-end services at lower cost and augmenting resources for customers’ R&D. The providers have since moved up the value chain, taking over complex product development tasks, improving quality and decreasing time to market. India’s ER&D industry is in a mature stage, and unlike in the past when cost efficiency was its edge and differentiator, it now has to deliver 1) complex, higher-end services, 2) a good business model 3) a presence across all verticals, 4) complete product development capabilities, 5) a formal innovation culture resulting in IPs and tactical innovations, and 6) fixed price including outcome based and risk reward pricing models. All of this is quite possible, based on the success of IT services. According to NASSCOM, the current phase will lead to increasing home-grown innovation, resulting in higher margins and an increase in value added services. In FY15, in-house ER&D centers contributed $ 12.25 bn to India’s ER&D industry whereas third-party ER&D service providers contributed $ 7.76 bn. We estimate that LTTS had a 5.7% market share in the Indian ER&D market in FY2015. The new trends which have a direct impact on the ER&D services industry include emerging technologies like IoT, robotics, wearable devices and 3D printing. The India-based ER&D services industry grew faster than the global industry. FY15 over FY14 growth rates in the global ER&D industry for in-house R&D centers and third-party ER&D service providers were 7.6% and 8.7%, respectively. In FY15 over FY14, India-based in-house R&D centers grew by 8.3%, and India-based third-party ER&D providers grew by 12.7%. India-based captive R&D centers are projected to grow at 13.3% CAGR and India-based third-party global ER&D service providers may grow at 14.0% CAGR from FY15-20. Source: LTTS RHP. 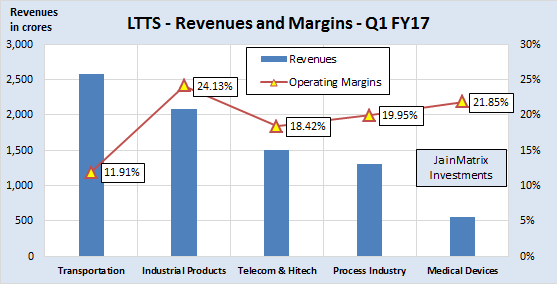 LTTS’s revenue, EBITDA and PAT grew 18.9%, 40.7% and 34.0% in FY16. The FY17 data is a simple projection of the Q1 FY17 results. The dividend rate is rising. LTTS paid a dividend of Rs 14.2 in FY16, a yield of 1.64%. Revenue growth is moderate, but margin growth is impressive. See Fig 5. The EPS growth is a positive, and it has generated Free Cash Flows, a positive, Fig 6. LTTS has a ROE of 38.8% (FY16) making it amongst the best in the industry. The cash per share including Reserves & Surplus plus Cash in Balance sheet is Rs 118/share. So the current operations of LTTS are available at (860-118) = Rs 742/share. We benchmark LTTS against peer companies like Cyient, Tata Elxsi, Mphasis etc. See Ex 7. LTTS appears to be available at moderate valuations in terms of PE and P/B. It has a high ROE and ROCE, and the dividend yield is good. The strong balance sheet can be leveraged for acquisitions. Utilization rate is the lowest at 71.4% (FY16). But in Q1FY17 it improved to 76.2%, and there is room for improvement. Margins are average, however they are growing fast. ER&D services are a very stable business linked to client product launches as it is often a critical activity for them. India offers a number of competitive advantages for ER&D, including technical and managerial talent pool, low costs, stable business environment and an open economy. LTTS is part of the L&T group, which gives it a access to 1) specialized knowledge and talent in many sectors 2) a good customer base in India & Middle East 3) synergies with L&T Infotech in cross selling and sales, where they are working together. The IPO pricing is fair, and at upper band of Rs 860, LTTS’s asking P/E is 25.4 times. 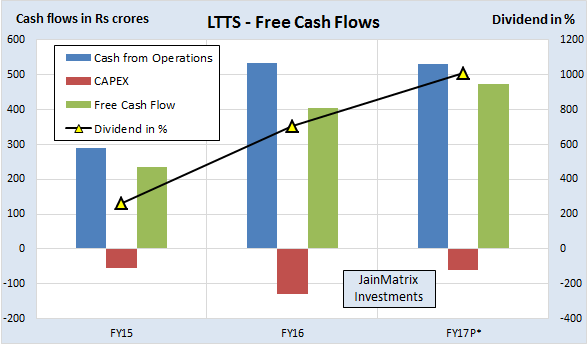 LTTS has a good balance sheet. It has high ROE and ROCE numbers with good margins. It has a diversified client base with a majority giving repeat business. L&T used to own preference shares in LTTS, but they were redeemed by May 2016, so there are no outstanding preference shares. This will boost profits of LTTS in FY17 compared to previous years. With revenues > Rs 3,000 crore and employees > 9,000, LTTS is well placed to pitch for and win large size $10-20 million deals and new business in ER&D. With a good geographic spread and employee strength, LTTS has the potential to grow rapidly. Attrition rates are low. Per management it will double revenues in 3-4 years with M&A and organic growth. LTTS might engage in acquisitions that may not be successful or meet expectations. LTTS’s business could be adversely affected if they fail to develop new services and solutions or enhance existing services or if they fail to meet customer expectations. Exchange rate fluctuations could impact financials. Revenues in USD and in Euro amounted to 76.2% and 11.3% of revenues in FY16. LTTS does not hedge against all forex risks. As of now, they have outstanding unhedged forex receivables of Rs 733 cr. and payables of Rs 17.6 cr. Inflation and urban costs increase affects the resource oriented business such as LTTS. It will have to ensure that costs and attrition remain in control. The sister company, L&T Infotech operates in the IT services space and has global clients. While these 2 firms have well defined spaces, there will be many areas of overlap or where coordination among them is required and sales conflict. The changes in technology can be rapid, and if LTTS does not adapt fast enough, the firm can be rendered obsolete within a few years. Europe and Mid-Eastern regions seem to be facing slow growth or even recession. A reduction in the R&D budgets of their existing and prospective customers could affect LTTS pricing and volume of work. Similarly customers may stop or reduce the scope of outsourced ER&D work or may set up captive R&D centers, which may result in a reduction in their volumes of work. 94.6% of revenue in FY16 came from existing clients whereas revenue from new customers was only 5.4%. This could be a sign of weak new business & sales pipeline. LTTS has mentioned that it will grow with acquisitions. However the firm has a limited history of acquisitions and the task of M&A integration is complex and risky. The recent group listings of L&T Finance Holdings (2011) and L&T Infotech (2016) met with limited success. After the IT services sector growth over the last 2 decades, the ER&D sector appears to be the next generation opportunity for more advanced, sector specific product R&D services delivery. There are big opportunities for India in the global ER&D market. India is already a hub for global small car design, innovation and mfg. It is possible that the ER&D can extend this success to other auto sub sectors, telecom, industrial products, etc. The govt. has set up a Make in India program to grow mfg. However ER&D services seems a more likely candidate for success as it speeds global mfg. and innovation. LTTS has excellent group credentials in the ER&D space with access to L&T knowledge and skill base, and customer networks from L&T and L&T Infotech. So far, the 2 year old company has shown good signs of business solidity. It is the leader in the Indian ER&D space. Most larger peers are software + ER&D players. At a FY16 PE of 25.4 times, the valuations just seem to be fair. However the projected FY17 forward PE of 17.7 times based on the current run rate, looks attractive. The LTTS IPO is rated a medium risk, medium return type of offering. Investors may BUY with a 2 year perspective. How will Brexit impact Indian investors? Visit the Investment Service page to find how you can get more. Or Click LINK. This document has been prepared by JainMatrix Investments Bangalore (JM), and is meant for use by the recipient only as information and is not for circulation. This document is not to be reported or copied or made available to others without prior permission of JM. It should not be considered or taken as an offer to sell or a solicitation to buy or sell any security. The information contained in this report has been obtained from sources that are considered to be reliable. However, JM has not independently verified the accuracy or completeness of the same. Punit Jain has a small equity ownership < Rs 2 lakhs in L&T, where he is a shareholder since 2007. Other than this JM has no known financial interests in L&T Technology Services Ltd. or any group company. Neither JM nor any of its affiliates, its directors or its employees accepts any responsibility of whatsoever nature for the information, statements and opinion given, made available or expressed herein or for any omission therein. Recipients of this report should be aware that past performance is not necessarily a guide to future performance and value of investments can go down as well. The suitability or otherwise of any investments will depend upon the recipient’s particular circumstances and, in case of doubt, advice should be sought from an Investment Advisor. Punit Jain is a registered Research Analyst under SEBI (Research Analysts) Regulations, 2014. JM has been publishing equity research reports since Nov 2012. Any questions should be directed to the director of JainMatrix Investments at punit.jain@jainmatrix.com.